Picture from: Le Portefeuille Industriel, a collection of technical drawings from Musée des Arts et Métiers. The Tsunamipants project surfaced from this shift as an attempt to address these issues in an engaging way. The Tsunamipants project shows the traps that are hidden in responding to problems by coming up with solutions that are built within the limits of the problem. This invariably creates new versions of the same problem, it doesn't solve them. That is the tragedy in which the inventor Martin Brolin is caught in the Tsunamipants project. Martin engages the extreme weather conditions that are associated with future climate changes and tries to engineer his way out-off danger. In his work Mr. Brolin suffers from lack of expertise, lack of budged, oversized ambition and being over-all mediocre. These are common human traits that run beneath the surface of positive social change. To be able to construct anything realistically and therefor longlasting, I suggest we start by acknowledging that there is nothing inherently wrong with being mediocre. I realise that this goes against giant forces in popular culture, but Martin is deliberately portrayed as a mediocre inventor, although I only later became fully conscious of why I was doing this. This research was undertaken in the middle of the Climate Change debate. A seminal event that shaped the discussions in this topic was Al Gore's documentary 'An Inconvenient Truth.' It forced the debate into negative arguments that closely follow the Christian tradition of Man as the species fallen from Grace, which now has to suffer. 3) What adds to the feelings of despair around these issues is the complicated nature of environmental and social problems and solutions. There are seemingly endless secondary effects and influences hidden beneath the surface of discussions. I would say that the current nervous tension that is aroused by Climate Change discussions may have one beneficial effect. It may alleviate what Theodore Dalrymple describes as the 'transcendental boredom' of a vast middle-class who are unlikely to gain or lose much in material assets and whose lives are lived in passive consumption of goods offered by large anonymous corporations. He suggests that this feeds into a self-destructive trend, which has been surrounded by an aura of profundity in Romanticism. 4) The unstable climate brings uncertain futures, which forces us to rethink our lives. This clashes with the 20th century phenomenon of José Ortega y Gasset's 'mass-man', the ultimate in post-modernity; man liberated even from thinking. 5) Crises seem to have a way of waking people up. If we want to look at sustainable ways of living we should look at the lowest classes in society. I suspect the higher classes have been living in unsustainable patterns for longer. Recently some advocates of change based on positive arguments have become more visible such as the 'Slow-Food'-movement, the 'Cradle-to-Cradle' and 'Permaculture' design principles. 6) These forces originate from the possibility of improving the quality of life, this includes of course other life-forms besides humans. Tsunamipants applied in a society of risks. Western society has put increasing efforts into the elimination of risk. Populations are kept safe by systems of regulations, by insurance and by law. This is perhaps another source of 'transcendental boredom'? Certainly people set new limits when risks are eliminated; car safety has dramatically changed diving behaviour. Chauncey Starr found that people accept risks 1000 times greater if they are voluntary (driving a car) than if they are involuntary (nuclear disaster). And when something bad happens, the focus of attention seems to be on finding out who is responsible. The Precautionary Principle, Al Gore's sustainability and Bush's Pre-emtive Strike are examples that demonstrate reflexive modernization. Philosophies like these brought us the stupid instructions on rear-view mirrors. He suggests people have 'social risk positions' that are achieved through aversion, which differs from wealth positions that are gained through accumulation. He also sees a boomerang effect where people producing risk are the most vulnerable to those risks. Some delicate reasoning goes behind this and I refer anyone who is interested to go to the Risk society page on Wikipedia (also page mentioned below). Psychometric research has shown some funny methods people tend to use when they asses a risk. If the threat is easily imagined it looks more dangerous. People will piece together unknown risks form parts that they do know. People make very interesting choices when they way the possibilities of gaining or loosing; they rather loose a little all the time (insurance). And research has revealed that the risk-assessment of experts is often not much better than that of a lay-person. Hierarchists, who fear those risks that threaten the ordering of society. Egalitarians, who use risk for social cohesion. Individualists, who fear the collapse of the market. Fatalists, who feel it is all inevitable. And the World Economic Forum has a Global Risk Network which brings out annual reports on global risks. Safety engineering usually is seen as a part of system engineering. It studies the working of a system when a part of it fails. The dynamics of this are visualized in a fault tree diagram. So this study is limited to faults that occur in the area of manufactured risks. Martin Brolin works mostly with external risks or with manufactured risks that result from external risks. Just as at the court of Louis the 14th introversion was unthinkable, in our society happiness is a must.8) It is all fun. The Disneyfication of society deals exclusively with positive aspects of life and fits seamlessly with modernistic fears and precautions. Root to Disneyfication and risk perception is the fundamental proposition that problems should not be. They exist to be eliminated and should be got rid off as soon as possible. In tackling problems the common strategy is based on imagining a more positive, altered future. This process usually only reshapes the problem, because your solution mirrors the problem, making sure it keeps on existing in new forms. What really eliminates problems is finding ways of being the needed change now, to imagine new ways of being. Another option that works well is to dedicate yourself to problems that inspire you. We call people who do this visionary leaders. Martin Brolin exemplifies the design strategy where solutions only change the problem to a new form. That is what makes the inventions funny. Basically Tsunamipants are a design statement, it shows with traps not to fall into. Tsunami Pants is embedded in the European tradition of the drawn narrative. There is a long tradition of mad-scientist and eccentric inventors in fiction. There are other art and design projects, that tackle similar issues, but none offer a historic collection and none make design-series embedded specifically into the debate about climate change. The Yesmen made the survivaball. Ralph Borland made Suited for Subversion. Ann de Gersem made the Life dress. Yael Mer made the Canoe dress. Troy Hurtubise made the Grizzly and Troyan suits. Eelko Moorer made Emergency Games, a booklet of rather unimaginative but dangerous games to be played at home. Adam Whinton and Yolita Nugent's project 'no-contact' self-defense jacket for women. Interactive clothes by XS-lab, Despina and Papadopoulos or Hussein Chalayan. Since last year (2006) FoAM is adapting to a working method and living method that reduces our negative impact on living conditions for life on Earth. We are aware of the great need for this to happen, not just for members of our organization but for society as a whole. We would like to activate others to reduce their damage to the biosphere and society too. So at some point, and it has already arrived, our organization is going to communicate about issues concerning these environmental and social crises. Now nobody enjoys bad news. Being aware of and dealing with these often deep-rooted problems and the associated doom-scenarios can drain energy from those undertaking the efforts involved. Or even observers of the efforts. Past strategies, in the last 3 decades of the second millennium, have generally adopted a negative tone of voice, the voice of abstinence. Abstinence can be heroic but is apparently enjoyed by few and although sincere, heroes and sincerity can be awfully boring, when presented without humor. My aim is to show the ridiculous way in which we sometimes go about constructing solutions for climate-change problems. Martin Brolin is created to explore a way of engaging with this crisis in an uplifting way, by showing just such flawed design-strategies. Expected outcomes of the research. This project was born out-off a conversation about designing clothes for extreme weather conditions. I expected to have a range of clothing items that would be suited to surviving specific meteorological threats. These would be either drawn or prototyped. These designs should be funny, so this implied they probably would be impracticable to some extent. To show the use of the inventions I imagined short stories and perhaps a collection of stories would be the end product. Another angle of creating a character would be to see how it can function as merchandise or how it can be weaved into the realities of FoAM. Designing Tsunamipants, how it works. The first step to design portable safety technology for natural disasters is to make a full list of these horrors. From this the first opportunities for design become apparent. This can be complemented by a list of controversial technologies (biofuels), activities (air-travel), objects (SUV-s) or places connected to climate change issues (holiday-resorts). By pairing disasters to items from the other lists inspiring combinations can be found. Making a collection of historic and current solutions in wearable safety systems, gives a greater scope of possibilities in design. I also looked at protective systems used by animals, for instance the fat-layer used by sealions for insulation and food reserve. And I based Martin's design of the jelly suit on this. Another place to look for good ideas is comicbooks; the superstrenghts often mimic animal strategies. Character development of Martin Brolin. The narrative structure of this research hinted at the value of having a central character. While driving to the supermarket, I came across an individual who combined most of the characteristic that I was looking for; mediocrity, recklessness, lack of social inhibitions and self-confidence from unknown origins. In essence a rationalist or even Deist, who feels God may have created the world, but has abandoned it and left without enlightening us. Martin should be European, because of the Christian flavouring of the climate-change debate. I chose Sweden as his native country. The unforbidding natural forces that shape that country would also shape the right kind of mental state for my survival engineer. In retrospect it is remarkable to see that for tackling the issues connected with the changing climate, I designed a suffering man in his thirties with long hair. The Christian imagery must have been playing in the back-ground. Justification of the methodology; the strength of physical experiments. Giving environmental problems a direct physical presence for people is one of the great obstacles within the debate. Things happen too slow to see and feel, but extreme weather that is associated with climate change is very tangible. Although it is too big to bring to peoples physical reality, like Saint Francis of Assisi often did, Tsunamipants resemble the 'stunt-element' Francis used. And although he did these 'stunts' as a live-show, which may very well be crucial to their success, I will tell the story of Martin Brolin on paper to start with. And just how far Martin Brolin's activities are going to extend into other media and reality, will become apparent as the project unfolds. There are great results to be gained from direct action. This was shown by Srinivasan Soundara Rajan and Marko Peljhan at the Luminous Green symposium and by Suprabha Seshan at the Hands-on Change symposium. 10) The Tsunamipants research project tapps into this tradition and hopefully with the same infectious enthusiasm. I made one case study by following the events around a particularly violent storm on January 18, 2007 in the Netherlands. This research gave me a much richer picture of meteorology, global systems, safety engineering, character design and storytelling. these horrors may result in Leapfrogging effects for the regions or nations affected. many superheroes got their power in accidents so this might create opportunities for those supernaturally inclined. What became apparent during the Tsunamipants project is the constant need for new angles. The first design was for a piece of clothing that can help to survive a disaster; the Tsunamipants. You can go on creating more designs for clothing, but the novelty wears off soon. So I moved to SUV-s with the Inflatable-hummer, tackling the debate around climate change from a new perspective. This became a working strategy. Switching to tourism (forest-fire cuisine), eco-art (edibleTRG), food-politics (beggar bumper) and alternative fuels (cowpod). Some inventions work better as a story, when the dynamics of its use are important. Others work just as a concept. During the work a person was created to give the project a unified base. This greatly improved the narrative potential and engagement for the project. Collision Impact > in case of things crashing into you in hurricanes etc. Head Protection > how to keep your head from falling off or rotting away. Emergency Storage > pretty amazing tools for any emergency. Emergency Signals > communication and getting noticed. Aquatic tools > heavy duty water assistance. Escape tools > getting out. Medical Aids > hackable medical devices. Remotely Operated Vehicles > going to the places you don't want to go. Cold: clothing is extremely wide spread in society and lots of different items are for sale. Impact: from car-construction and airbags, to tanks and motorcycle suits, things hitting people or falling onto people are numerous. Disease: this secondary effect of bad weather conditions is in third place. Because not all medicine falls into this category. Drowning: and other water related risks are very big business for offshore and recreational purposes. Designs that offer protection to the head or part of the face, especially the nose. Things that offer escape from large structures. Tools for signaling and navigation. Comparison of the expected and the actual results. 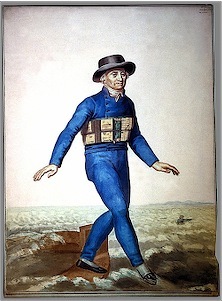 My research broadened from designing clothes for meteorological catastrophes to a wild and hilarious journey through portable safety technology. I did not go into material research for this because that seemed like a world too vast to cover. And it would not have been effective for reaching my goal, which relies more on imagination than on expertise. But it would have fitted nicely with research done by Lina Kusaite, who is looking into developing a material library. The domain of portable safety technology turned out to be much more varied than I anticipated. The history of portable personal safety technology is rich. An overview of this field formed and it shows the diversity of technologies and suggests risk hierarchies. For a successful Tsunamipants design some ingredients are crucial. I look at the combinations of already existing products and fusing them into an unlikely hybrid. As noted above, the need to shift focus became apparent during the design stages. This resulted in designs for many different situations, more connected to climate change issues in a broad sense and not just weather induced disasters. Suggestions and comments on the research process and its results. Suggestions for the future work based on the conclusions of the research. The survival engineering collection could be extended with strategies used by animals and plants. Martin Brolin could be used to study the possibilities of merchandising. Tunamipants could pop-up in FoAM or FoAM partner events. Move from the history of safety into the direction of the history of sustainability. I've started tracing my own cultural roots; into the Zeeuwse farms and their (forgotten) technologies. More Tsunamifood, like the Noodleboots, and associated recipes. The design of Martin with a bad haircut, slightly overweight and big was intended to place him as a very ordinary guy. But some members of the public have commented that they found it difficult to feel sympathy for him. During the process Martin sometimes devolved somewhat into a bum. He sometimes became more of a caricature, this was largely due to the linear style of drawing that was applied and the scale of working. The public responded well to presentations. Finding unlikely combinations, unlikely threats or solutions seemed powerful tools for connecting with people. Also a good name for the invention works. The imagery may work better in full-color. Media used in the research. many dozens of cites had wonderful designs and pictures, they are documented in the survival engineering collection. Le Portefeuille Industriel, a collection of technical drawings from Musée des Arts et Métiers. Material generated in the research to be archived at FoAM.